Clarets boss Sean Dyche insists the club are prepared to let Michael Keane run his contract down and leave on a free transfer if the right deal isn't forthcoming this summer. Keane looks certain to depart Turf Moor in the summer, with an auction expected between a number of top Premier League clubs. The 24-year-old has been strongly linked with Everton and Manchester United, with Liverpool, Manchester City and Chelsea all reportedly interested. An ever-present for Burnley this season, Keane has enjoyed a hugely impressive campaign, making his England debut before being nominated for the PFA Young Player of the Year award. But, with one year left on his contract, Burnley either sell this summer, or risk losing him for nothing in a year's time, with the player looking unlikely to sign a new deal. That is a risk the club are happy to take, however, as Dyche admitted: "Absolutely, we're in a great position, if that came around. We're in a stronger position now. "I'm open and honest with the players. "We'll look at it and speak to the relevant people, if it doesn't fit, crack on." 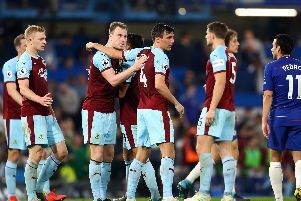 Dyche has had to contend with a number of his players attracting speculation, but he is used to it, and accepts it is part and parcel of the job: "I think it's a natural part of the club's continuing progress, , it comes around, its good in one way to have your players linked, getting recognised by, usually, bigger concerns. "The challenge is then contractual, a financial numbers game, players that are happy, settled, divisional status, etc etc. "It's ongoing, as it is at most clubs. "It's just enhanced, more so in the Premier League than in the Championship. In the Championship we'd be viewed stronger for all the different variants, pushing to be in the Premier League, financial, etc. "In the Premier League we go to the bottom end of that market, so that's the way it is. "The only shortcut is if the man with the money says 'here's loads of money', and I'll spend it. "But we don't and can't do that here, so you manage what you can manage." Andre Gray, like Keane, has a year remaining on his contract and is being linked with a move away, while George Boyd's current deal runs out in the summer. Dyche is happy the club are on top of the situation: "Talks with all players are always going on. I don't lie, we're open with all the players. "We all sing from the same hymn sheet, it keeps it really simple. "Everyone knows where they stand." Burnley's last season in the Premier League ended with Danny Ings, Kieran Trippier and Jason Shackell leaving, but Dyche rebuilt to win the Championship title. Should the likes of Keane go in the summer, Dyche accepts the recruitment department will be pivotal: "Its a challenge, because the big thing is recruitment, getting the right people in at the right cost base, wages etc. It's massive for us. "We're the lowest end of the market, so it's not just the package, it's the whole thing with the club, and often it is down to finance. "Players want good contracts, simple as that."